Clinical nutritionist Sophie Manolas offers some great ideas and recipes for using your everyday diet to help deal with the menopause. I get to see a lot of health books and cookery books that have a healing approach. I have often been struck by how many really good ones about using the food we eat to heal many of our ills do seem to come out of Australia. Maybe the outdoor life inspires this, and certainly healing nutrition and alternative remedies are very much part of the culture from the many good uses for Tea Tree Oil to Australian Bush Essences. So when a new book came my way by Australian clinical nutritionist Sophie Manolas I was interested to see how it could help with some of the common symptoms of menopause. ‘Whatever stage you are at, and whatever changes you might be experiencing, good nutrition is always the best place to start and this doesn’t have to mean a Draconian switch to raw foods or organic veganism. From avocado to zuccini – how can they help your menopause? Sophie is a clinical nutritionist whose rural childhood taught her the importance of the vegetable patch and fresh produce. After qualifying in Nutritional Medicine, she established her own practice, and has achieved great success with her down-to-earth approach. She looks at the health benefits of over 60 commonly available and nutrient-dense foods, but that actually is almost the least important part of the book. Stunning photographs illustrate some simple delicious way to improve your mind and supercharge your health. If you want to eat well, minimise menopause symptoms and avoid illness, then she has the recipes to help you do just that. This is just about neck and neck with worries about hot flushes and, just like them, is sadly is often all too visible. Oestrogen dominance means an extra layer of fat and no matter how hard you exercise or diet it can be difficult to shift. Switching just a few items in your diet could make all the difference. * Cinnamon can help reduce insulin resistance – a common condition when the cells stop listening to the hormone insulin, resulting in weight gain and an increased diabetes risk – as insulin encourages the uptake and utilisation of sugar in the bloodstream. * Avocados are a new ‘superfood’ and they will help you feel fuller for longer, which helps to curb cravings for high-sugar foods. * Broccoli has so many health benefits but did you know it could also help with weight loss? * Pulses and seeds are also good for weight control so add chickpea, lentils and Chia seeds which have a high protein and fibre content to keep you feeling fun for hours. Women often underestimate the risk of heart disease at menopause, but it is more dangerous than cancer in terms of deaths per year. Bioidentical progesterone supports heart health, and don’t neglect these heart helpers either. A hidden danger at menopause is the increased risk for osteoporosis as there are no visible signs until you break a bone. If you have a risk for this disease then a preventive diet is a good place to start and then boost your diet with bioidentical progesterone to help build new bone. * Leafy greens are best combined with the sesame seeds to give you a good form of absorbable calcium. * Brussels sprouts are high in antioxidants, and with vitamin K and vitamin C are good for your bones. If you want a great way to use them look for the recipe for honey roasted sprouts combined with onion and garlic – it even converted me! Anxiety, mood swings, hot flushes – who would welcome menopause? But it can be helped by maintaining good hormone balance and ensuring your diet does its best to support, not sabotage, your symptoms. 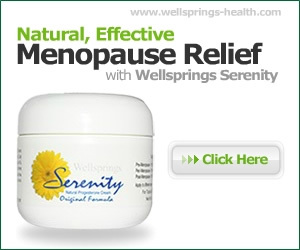 Menopause is a constantly changing evolution, so using your everyday foods and supplementing with bioidentical hormone creams will help you stay on top of the mood swings, hot flushes, and more, that can descend on you at this time of life. You can find more information on Sophie Manolas at her website http://www.theediblepharmacy.com and her book is available online and in book stores.